Grilled pork glazed with a piquant apricot mixture looks beautiful atop a salad sporting dried cherries and toasted pecans. In small bowl stir together preserves, vinegar, mustard and ginger. Reserve 3/4 cup for salad dressing. Butterfly pork tenderloin (cut almost in half, but not quite through, horizontally; open and lay flat. Prepare medium-hot fire in kettle-style grill. Grill tenderloin over heat 5-6 minutes per side; brushing with remaining apricot mixture during last 2 minutes on each side until internal temperature on a thermometer reads 160° F. Remove tenderloin to cutting board. Meanwhile in large bowl toss together greens, apricots, cherries, cheese, pecans and onions. Divide mixture evenly among 4 plates. Slice pork into 1/2-inch pieces. 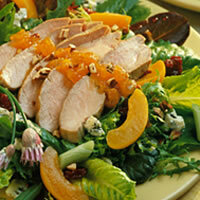 Arrange portions of pork on top of greens on each plate; drizzle with reserved apricot mixture. Ingredient Tip: To toast pecans, place pecan halves in shallow baking pan in a 350° F oven for about 10 minutes. Let cool, chop coarsely.